This course provides an introduction to forensic psychology, the field that deals with applications of psychological theory, research, and practice to the legal system. As part of this introduction, students explore the history of the relationship between psychology and the law. They also learn about the many roles played by psychologists in the legal system (for example, as expert witnesses, trial consultants, policy evaluators, and reformers), and the responsibilities associated with these roles. Sub-topics include: a) psychological perspectives on law enforcement and criminal investigation, b) determination of competency and insanity, c) risk assessment, d) child custody decision-making, e) jury behavior in civil and criminal cases, f) sentencing and imprisonment, g) the admissibility of scientific evidence, and h)discrimination, sexual harassment, and workplace law. My campus phone number is (973) 720-3389 and my email address is . The best way to contact me is by email. I generally hold office hours in SCIENCE 2039 on Mondays (11-12), Wednesdays (11-12), and by appointment. It is always better to schedule an appointment. 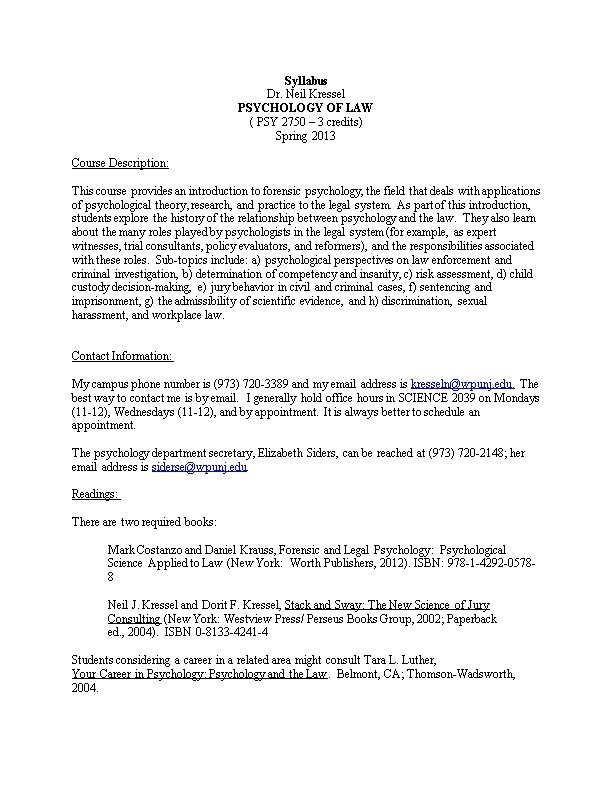 The psychology department secretary, Elizabeth Siders, can be reached at (973) 720-2148; her email address is . Your Career in Psychology: Psychology and the Law. Belmont, CA; Thomson-Wadsworth, 2004. Students will be able in written work to apply their understanding of the psychology of law to current cases and policy questions. Students will be able to explain how various psycholegal issues might by conceptualized and addressed by police officers, lawyers, psychological practitioners, and scientific researchers. 1. Grasp the implications of psychological theories and research for the understanding of various legal issues. 2. Demonstrate understanding of various roles played by psychologists in the legal system. 3. Demonstrate sufficient understanding of the historical and political context of psycholegal issues to speak and/or write intelligently about the field. 4. Tolerate opinions with which he or she disagrees. 5. Consider alternative viewpoints fairly. Weeks 1-2: Introduction. CK: chapter 1; Kressel and Kresselchapter 1. Weeks 3-5: Social Psychology of Jury Trials. (Jury selection, trial consultants, jury deliberation, bias). Kressel and Kressel, remainder of volume. CK: 6,13. Week 6: Psychology of Police Work -- I: CK: 2,3. Test one. Week 7: Psychology of Police Work – II: CK: 4,5. Week 8: Eyewitnesses. CK: 7. Week 10: Children and the Law. CK 11,12. Papers due. Week 11: Punishment and Sentencing. CK: 16,17. Week 12: Workplace Law.CK: 15. Week 13-14: Weeks 12-14: Presentations and topics to be announced. Lectures, readings, classroom discussions, student presentations, videos and demonstrations. Classes will often begin with a brief discussion of a legal case in the news. Students are encouraged to read a newspaper regularly in search of relevant cases. Students are required to: 1) attend class regularly, 2) participate in discussions and simulations, 3) take two tests, 4) write one (5-10 page) essay on an approved topic (dealing with a recent case or a current policy dilemma), and 5) present the paper in class. Although class participation, effort, and grade trends may be considered under exceptional circumstances at the discretion of the instructor, the key to a good grade in this class is successful performance on the tests and the paper. No extra credit assignments are planned at present. A variety of support services are available on campus. If needed, students should consider contacting the Academic Support Center (720-3324), the Counseling Center (720-2257), or the Career Development Center (720-2282).